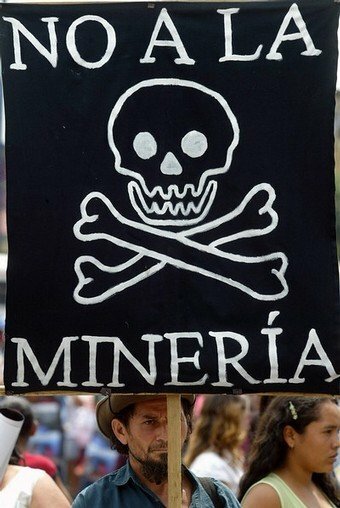 (Ottawa/Washington) The President-elect of El Salvador has publicly committed to prohibit new mining during his administration, just as his predecessors have done since 2008. OceanaGold should respect the democratic process in El Salvador, abandon its acquisition of Vancouver-based Pacific Rim Mining, and drop its lawsuit against the government of El Salvador for not having permitted a mine, according to international civil society organizations. A new study debunks eight falsehoods the company has used to try to justify mining in El Salvador and undermine public debate and policymaking. Canadian-Australian firm OceanaGold acquired Pacific Rim Mining in November 2013. Up against stiff local and national opposition in El Salvador, Pacific Rim has been trying to get at gold deposits in northern El Salvador for about a decade. In 2009, Pacific Rim launched what is now a $301 million lawsuit against El Salvador in a World Bank arbitration tribunal, arguing that the government must grant the company the permit to begin its El Dorado gold project. OceanaGold, having bailed out Pacific Rim from near bankruptcy in November 2013, aims either to strike a deal with the Salvadoran government or to continue fighting the suit. Pacific Rim did not meet the regulatory requirements necessary to obtain a mining permit in El Salvador, relying instead on political lobbying. Pacific Rim never undertook adequate studies to understand, much less mitigate, potential adverse impacts from the El Dorado project, especially on water supplies. There is broad opposition to mining in El Salvador that extends to the highest echelons of the Catholic Church. Pacific Rim’s activities in Cabañas have generated conflict, aggravated divisions, and raised the stakes around current and potential economic benefits from mining. This can only have contributed to threats and violence, which have yet to be fully investigated. Pacific Rim’s willingness to opt for political lobbying and local patronage, rather than meet regulatory requirements and respect communities, could have fueled corruption. Any profits from the El Dorado project would mainly be returned to the company and its shareholders. The company is using investor-state arbitration rules to subvert a democratic, nationwide debate over mining in El Salvador, a matter that should not be decided by a World Bank tribunal. OceanaGold operates an open-pit gold-copper project in the Philippines that illustrates the costs of mining that Salvadorans do not want to bear. These facts respond to eight “falsehoods” from Pacific Rim/OceanaGold that have been carefully debunked in a new report published by the Blue Planet Project, the Council of Canadians, the Institute for Policy Studies, MiningWatch Canada, and Oxfam International: Debunking Eight Falsehoods by Pacific Rim Mining/OceanaGold in El Salvador, available online here.